If you’ve been following Writinglikeastoner facebook page, I recently announced of having a giveaway of vouchers, to give back to the support that all of you have given me by reading the blog. The voucher that I’m giving away was given out during the SBA awards i recently went. The one that I’m giving out now is the Denizen $40 voucher off regular-priced bottoms. 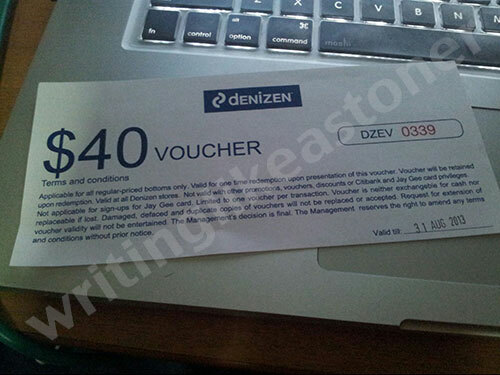 To simply win, just like my page Writinglikeastoner (if you have not done so), and comment on the post BELOW this blog saying ‘I would like the $40 denizen voucher from Writinglikeastoner”. Winner will be chosen using a random generator at the end of the week, 14th July 2013, Sunday, and notified through the Facebook Page and blog! *please note that the voucher is only available for Singapore residents! Did you know about the Domino Pizza 50% off pizzas? Check out the link below. Why is the 2013 Singapore Blog Awards Incredibly Awesome? This entry was posted in Stoner Journals and tagged denizen giveaway, denizen jeans, giveaway singapore, giveaway singapore blog, giveaway vouchers singapore denizen by writinglikeastoner. Bookmark the permalink. “I would like the $40 denizen voucher from Writinglikeastoner”!